Port Antonio Marina, also known as The Errol Flynn Marina, is located in the West Harbor and is the sailing gateway into Port Antonio, Jamaica. It is in a paradisaical landscape, surrounded by turquoise water and covered by tropical forests. There lies the perfect place for a relaxing vacation in the Caribbean sea. This yacht marina is an official port of entry and has 24-hour customs and immigration services. So it is an ideal place to dock while cruising the Caribbean. The annual fee to dock here has been reduced to encourage the registration of pleasure crafts and also facilitate home porting. If you are interest in docking here you should know there are thirty-two dockage berths and great facilities for larger yachts. 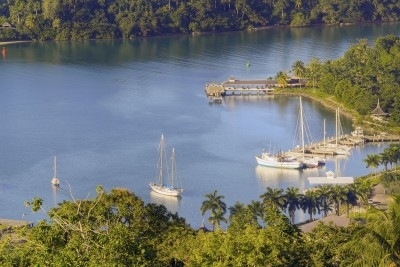 Port Antonio Marina's guests benefit from a fully equipped modern shipyard in case of need. Beside the Blue Lagoon, Frenchman's Cove Beach, Boston Bay and Reach Falls, this Marina ranks up there as an interesting touristic spot. The Marina is one of the best green spaces in the area where you can have fun with your friends and family. Or just lay back under one of the many palm trees shadow and enjoy the warm breeze and look towards the endless horizon. Whatever you want to do, reading, have a picnic, have a snack by the calm shores of the sea, have an ice cream, here is the place for you. Port Antonio's twin harbors facilities consist of a laundry, showers, a pool and bar and overlooking the Marina and Navy Island is a restaurant with affordable prices. You can enjoy the open space and admire the beautiful yachts docked here. In this part of the West Harbor you can walk along a promenade sidewalk where you'll find the Marina Police, Cruise Ship Pier, Coast Guard stations and souvenir shops. Close by is a private beach where you go for a swim in the crystal clear waters. Do take a water taxi and discover the Port's surroundings and maybe visit the nearby Navy Island which also has amenities for tourists. Nowadays it is a property of the Port Authority, but way back in its history, the 1700s, it was owned by the British Navy and they used the Port and the nearby island, called Navy Island, as a place to repair their ships. 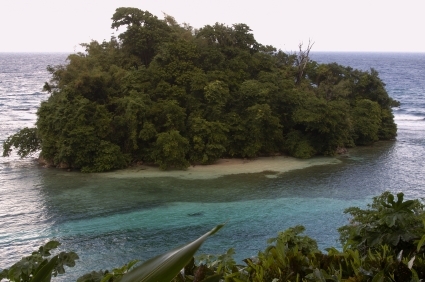 From the Port Antonio Marina you'll see the beautiful Navy Island. In 1723 the parish of Portland was created by the British who offered free land and slaves to prospective settlers as well as freedom, for a time, from land taxes, arrests or prosecutions. Fifty years later Port Antonio had no more than twenty houses with only the most desperate of settlers taking up the challenge. Different European families planned to build remote retreats but never did. And after many riots the island was deserted and the Jamaican Government took it over. Errol Flynn was mesmerized by what he discovered here and though he never built a real home on the land, instead he liked taking his yacht from one place to another. The only person who lived here was the caretaker. Learn more about the Errol Flynn Marina here. Today, Navy Island and the Port Antonio Marina may be the two places of this part of Jamaica where you can enjoy nature and discover this place from another point of view.